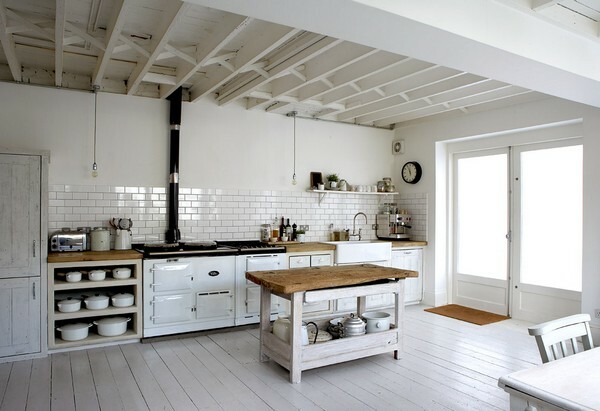 The use of white in the kitchen of all places is an idea frowned upon by many. 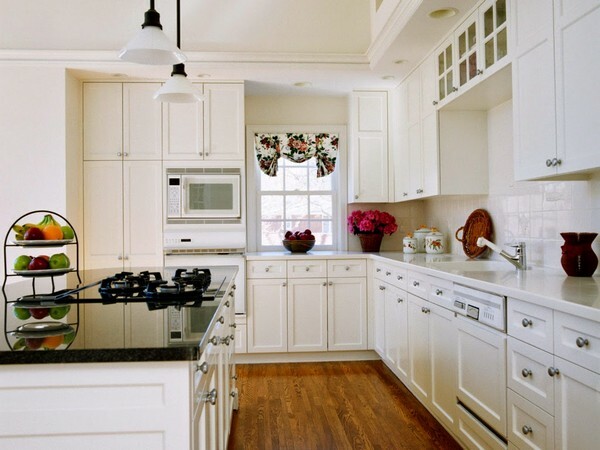 Not many homeowners are open to adopting a white color scheme for their kitchen, mainly because of the daunting challenges that arise when it comes to mantaining cleanliness. 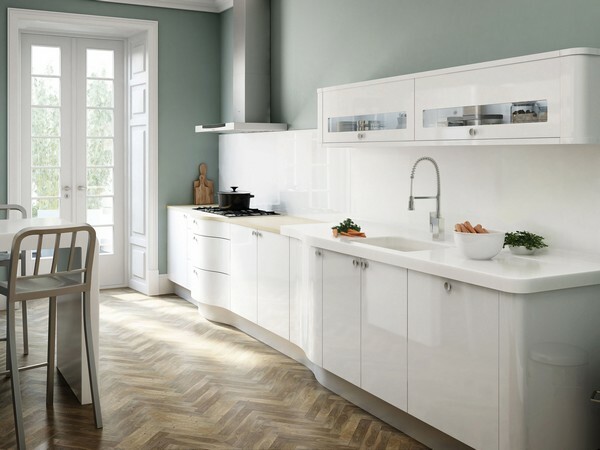 However, many will agree that a white kitchen is a masterpiece that will captivate the eye at every instance. 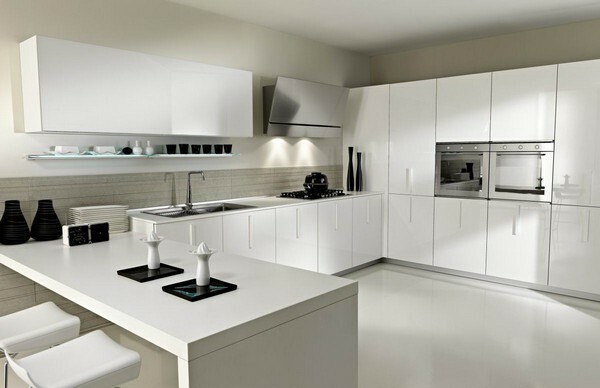 If you are bold enough to try the white kitchen style, below are some important tips we know you will need. 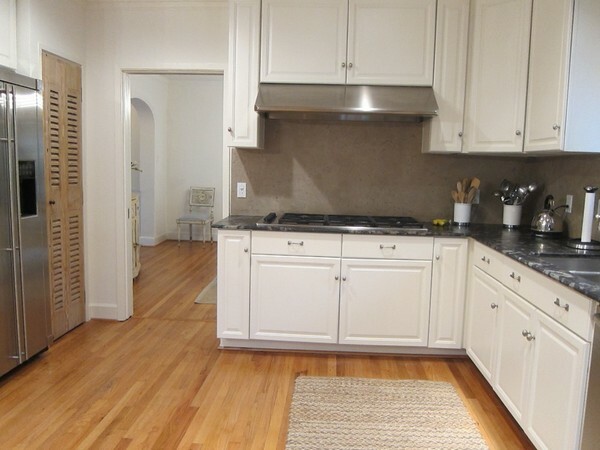 You can achieve a better look in your kitchen if you create some contrast. 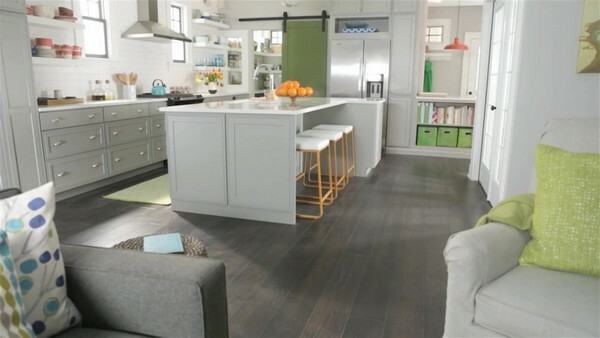 The easiest way you can create contrast is through the use of darker-colored floors, countertops and backsplash. 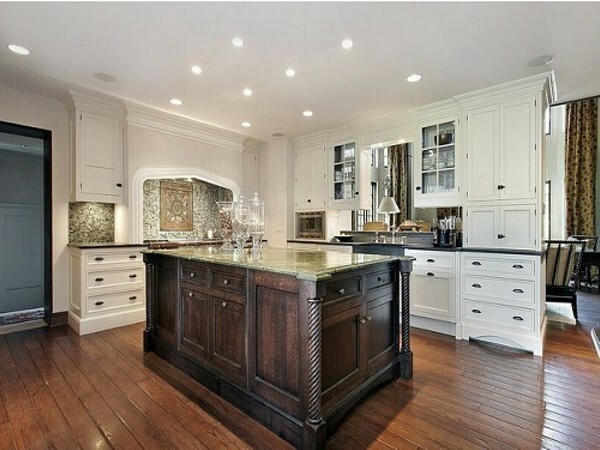 You will find hardwood or stone floors work especially well. 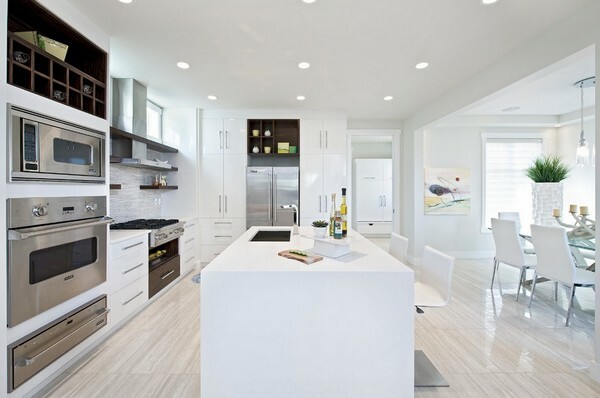 Lighting is a very important element in an all-white kitchen. 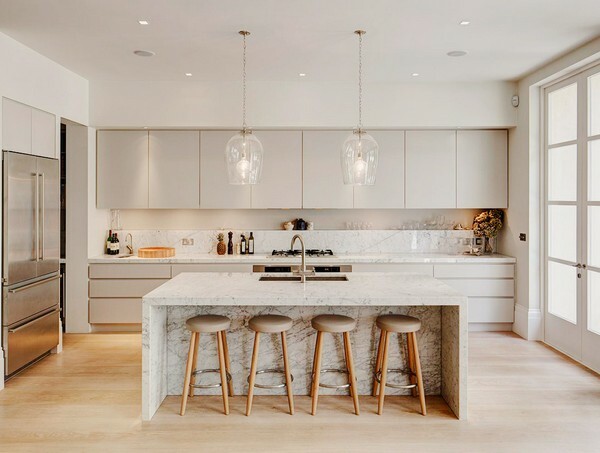 For one, the cabinetry and other furniture should be positioned in such a way that the natural flow of light into the kitchen is not restricted. 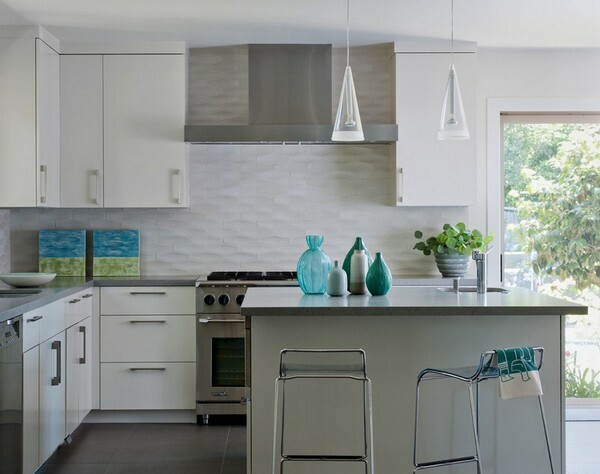 At night, this kitchen makes use of recessed in-ceiling lighting, overhead pendant lights and built-in cabinet lighting. 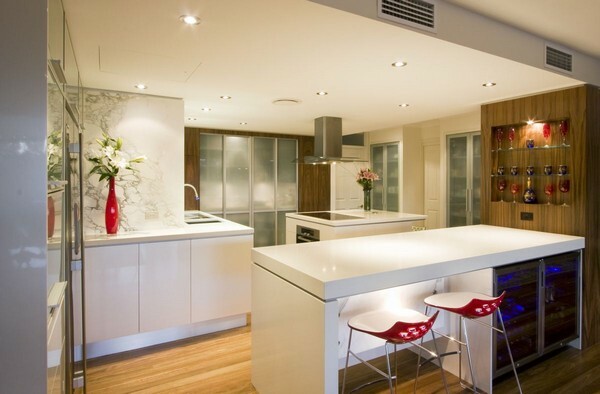 These features combine decorative and functional lighting, bringing an interesting dynamic to this kitchen. 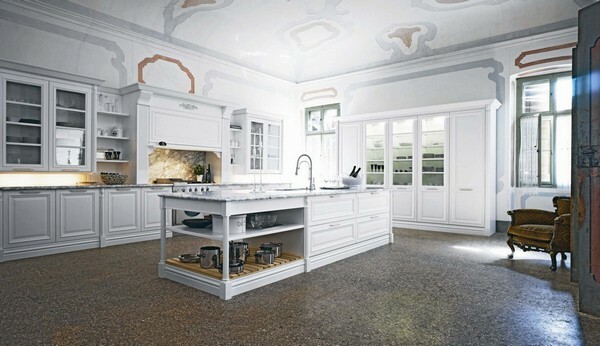 An all-white kitchen can be monotonous and boring to look at, which is why it could be a good idea to introduce color. 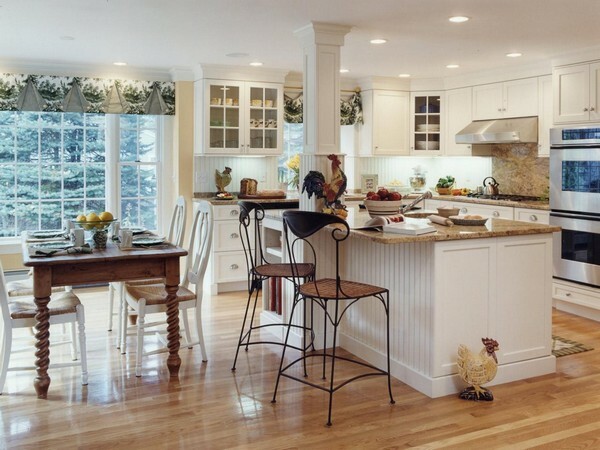 In this kitchen, the fruits on the bowls, flowers in the vase and brightly patterned curtain help introduce bright pops of color, breathing life into what would otherwise be a boring kitchen design. 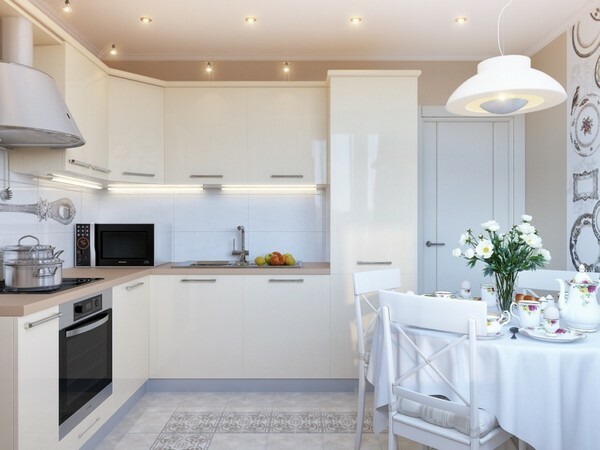 A room that sticks to a white color scheme can be especially difficult to decorate, especially because one easily risks taking the décor too far. 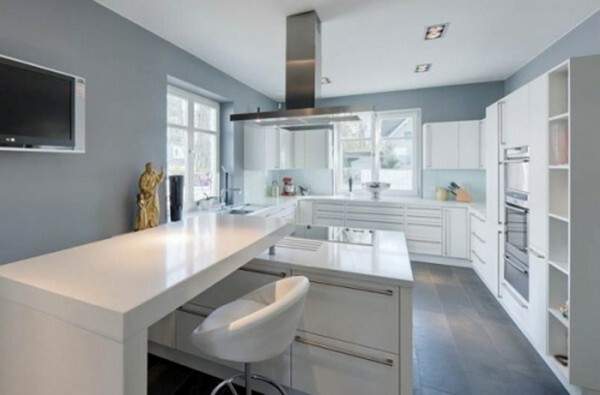 If you have a white kitchen, you will be shocked to find that the kitchen actually looks better with minimal décor and clutter. 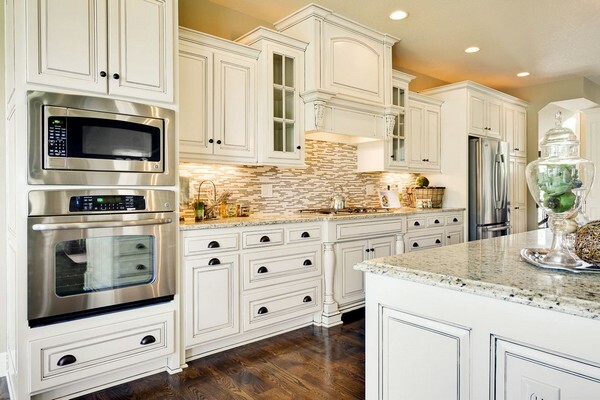 Only display the items you really need and keep those you don’t need away, to get a clean and organized look. 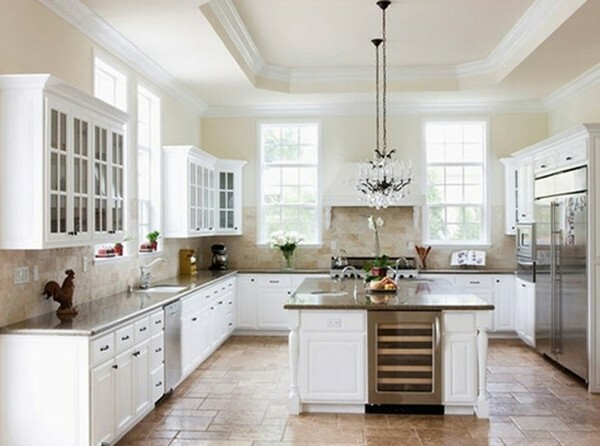 When opting for a white kitchen design, every homeowner should realize that there exist many different shades of white. 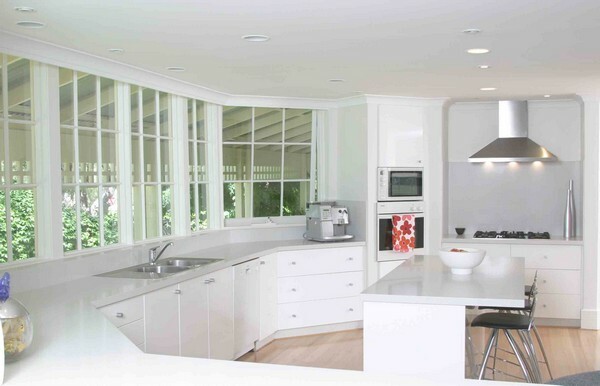 Extra caution is needed when selecting the shade of white, so that the shade chosen is right. Some of the most commonly used shades of white are ivory, ghost white, white smoke, snow, floral white, beige, antique white and champagne. 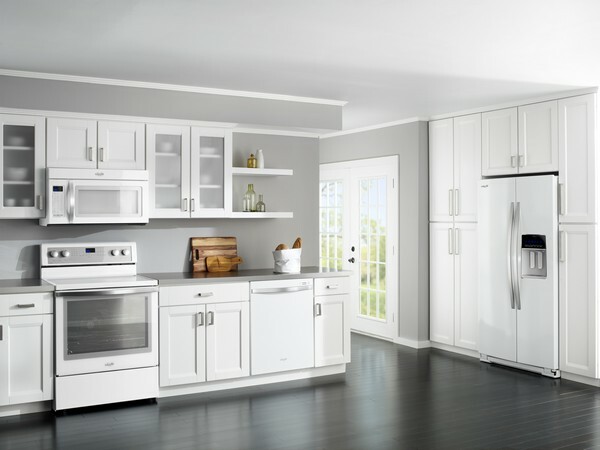 A white kitchen appears sophisticated and high-end when fitted with shiny stainless steel appliances that fit into the design seamlessly. 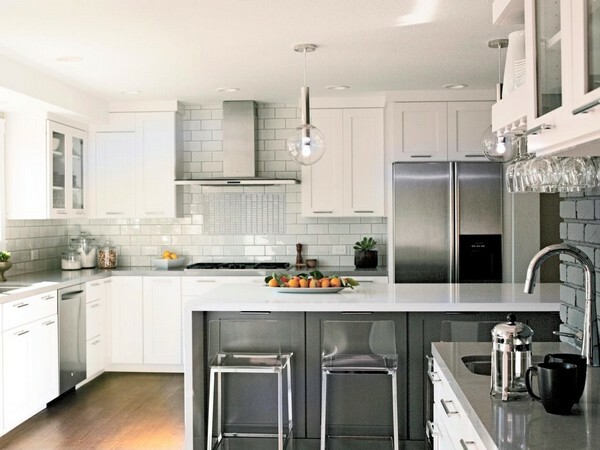 Whether it is the stove, microwave or refrigerator, add any stainless steel appliance to a white kitchen and you will notice the huge impact created. 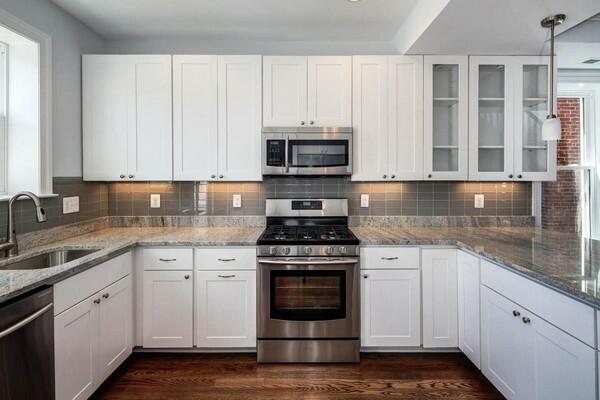 The countertops are important impact points in the kitchen, which is why it is always a good idea to have them contrast the white color scheme of the rest of the kitchen. 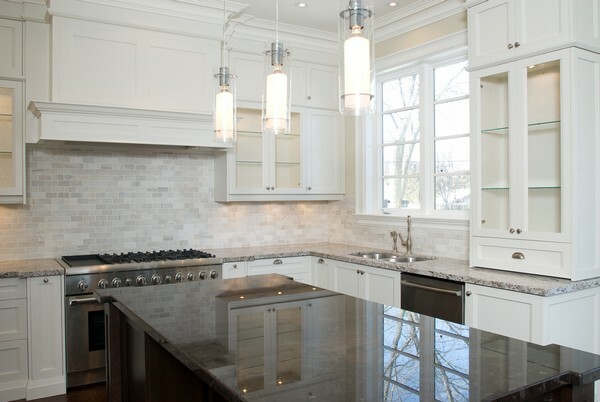 This can be achieved by using dark-toned countertops, such as grey.